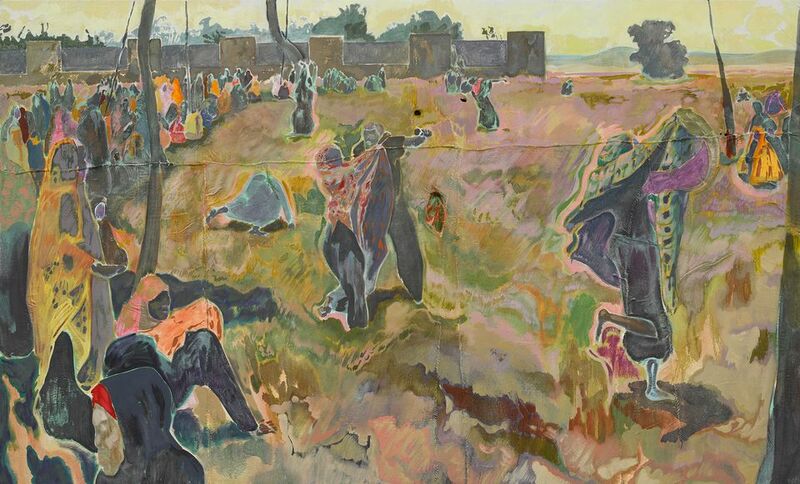 In his first major show in a public institution, the Kenyan-born London-based Michael Armitage’s large paintings fill the South London Gallery’s main gallery. There is Gauguin-like palette and flatness to the works in The Chapel (until 23 February 2018) that seamlessly mix East African imagery with familiar compositions from Western art history, such as in The Flaying of Marsyas (2017). The scene in the painting of a figure tied to a tree whose buttock is being carved off, is more wince-inducing than that of Titian’s 1576 masterpiece that inspired it. In Conjestina (2017), the vulnerability of even a trained fighting body is revealed in a portrait of the former world middleweight champion Conjestina Achieng, who is naked except for her boxing gloves. While in Exorcism (2017), the darker side of an apparent scene of jollity—the figures on first glance look as though they might be dancing—is only apparent on reading the unnerving title. There is quite an assault on the senses at Tate Britain for the latest exhibition in the museum’s Art Now series. The four walls of Marguerite Humeau’s installation Echoes (until 15 April 2018) are painted yellow. The hue is devised from the poison of a black mamba snake for a harsh interpretation of a colour usually associated with positivity. A step into this room is a hypnotic experience: the sculptures are inspired by Ancient Egyptian gods, while the sound of running water and the voice of Cleopatra reverberate in a nightmarish fashion. Through its clean aesthetic, Humeau draws influence from the middle period of Matthew Barney, whose Ottoshaft installation was the first in the Art Now series, 22 years ago. As much as Cleopatra samples invoke the past, this exhibition is undeniably futuristic. Afruz Amighi’s delicate works dance on the walls of Sophia Contemporary for her first solo show in London. Echo’s Chamber (until 19 January) includes nine new sculptures by the Iranian-American artist—who won the Victoria and Albert Museum’s inaugural Jameel Prize in 2009—using her signature materials of steel, chain and mesh. The translucent abstract forms that she creates are carefully lit to produce multiple shadows that give both depth and a haunting drama to her work. The pieces respond to what the artist describes as the “hypermasculinity” of the current situation in the US, where she lives, and the fragile socio-political environment in the Middle East, by exploring the ideas of heroines, matriarchy and femininity. Amighi has produced the sculptures from detailed drawings inspired by female characters from different regions and periods of world history, such as nuns and Amazonian women.